It is with great pleasure that I offer this photo gallery to visitors to this website. The Hidden Mountain Decalogue Tablet is one of the most important ancient artifacts ever found in North America. It’s existence offers mute evidence to the fact that ancient Old World civilizations not only explored but settled in ancient North America millennia before the arrival of Columbus. It is not only one of the most important ancient artifacts in North America, but also one of the least known and under-appreciated artifacts as well. This artifact needs to receive much more attention if the truth about North America’s past is ever to be reconstructed accurately. The photos of this artifact displayed at this website have been provided by (and are used with the permission of) Mr. Douglas Jones, President of the New Mexico Epigraphic Society. The New Mexico Epigraphic Society has been tireless in its efforts to locate and preserve vital ancient artifacts and inscriptions which attest to the true history of ancient North America. Those wishing to utilize or copy any of these proprietary photos for any purpose should contact Mr. Jones for permission to do so. Please direct inquiries to: Douglas Jones–President, New Mexico Epigraphic Society, PO Box 50007, Albuquerque, New Mexico 87181-0007, or email him at: epigraphic@comcast.net. These photos are of an artifact found at the base of Hidden Mountain, New Mexico near the city of Los Lunas. The main inscription is found on a large rock slab, and it proclaims the Ten Commandments in ancient Paleo-Hebrew characters. There are other inscriptions in the region which are also inscribed in ancient Paleo-Hebrew letters. I had the chance to visit and see these important ancient inscriptions several years ago in the company of Douglas Jones, President of the New Mexico Epigraphic Society. The Decalogue Tablet was in its original state at that time. Unfortunately, vandals defaced this artifact in 2006 so some of the original Hebrew characters have been obliterated. However, many photographs of the original Hebrew characters exist. The most vital element of this artifact is the fact that it contains an inscription of the Ten Commandments in ancient Paleo-Hebrew. Much evidence exists which confirm this artifact is genuine. Some efforts have been made to allege the artifact is not genuine, but contrary arguments (some quite fanciful) have been debunked by solid scholarship. 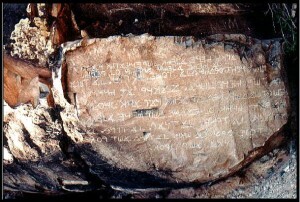 The authenticity of the artifact and its Hebrew inscription was even confirmed during a court trial in Albuquerque involving an epigraphic hoax re: other supposed “artifacts” in December, 1986 (“An Epigraphic Hoax on Trial in New Mexico,” Epigraphic Society Occasional Publications, Volume 17, 1988, pp. 206-219). You may be assured the Hidden Mountain artifact is exactly what it appears to be: an ancient Hebrew inscription of the Ten Commandments in an ancient North American context. The artifact’s inscription gives us critical evidence that it can only belong, in this author’s opinion, to the reign of King Solomon of the ancient biblical kingdom of Israel. The Paleo-Hebrew script was used by the ancient Israelites during the centuries which included the time of the United Kingdom of Israel under kings Saul, David and Solomon and the latter kings of the divided Monarchy when the tribes of Israel split into the two often rival kingdoms of Israel and Judah. After the people of these two Israelite kingdoms went into exile, the Hebrew language later used the “square script” style with which modern readers are likely familiar. Because the artifact’s inscription was made by Hebrews who understood and used the Paleo-Hebrew script, the artifact had to be inscribed at some point in history when the Paleo-Hebrew script was used. In other words, it dates to biblical times. The fact that the inscription proclaims the Ten Commandments to any and all who read it strongly argues that it was made during a time when the Israelites were not only obedient to the precepts of the Ten Commandments, but also considered it to be a cornerstone of their society. There were several times in the Bible when the Israelites were faithful to the Ten Commandments. Such times would include the time of Joshua and several Judges in the pre-monarchial period (the book of Joshua, Judges 3:14 and 30, 5:31, etc. ), as well as during the reigns of Kings David and Solomon during the United Monarchy and during several righteous kings of ancient Judah. In the pre-monarchial period, the Israelites were entirely occupied with subduing the Promised Land and fighting off other local enemies. The later righteous kings of Judah lacked the resources to fund such a large overseas expedition, and I Kings 22:48 and II Chronicles 20:36 record God stopped Judah’s effort to build a large overseas fleet from being built or deployed. King David’s reign was characterized by many wars, and he had no time for mounting expeditions to other continents. During other times in Israelite history, evil kings led the nations into idolatry and the Ten Commandments would not have been prominently inscribed by any Israelite sailors of their time on the other side of the globe! There is only one time when the making of this inscription makes historical sense: the reign of King Solomon. His reign had many years of unbroken peace (I Kings 4:21-25) and incredible wealth (I Kings 10:10-26). He also had an expansive heart and his mind had the scientific curiosity to learn more about the world (I Kings 4:29-33). King Solomon had the means, the opportunity and the motive to sponsor large maritime expeditions to other continents. Solomon continued King David’s alliance with King Hiram of the Phoenician city-states. Indeed, King Solomon’s Israelites and the Phoenician city-states joined their navies into a common fleet (I Kings 10:11 and 22, II Chronicles 8:18). Solomon even had a special fleet outfitted to go on very extended voyages. I Kings 9:27 and II Chronicles 9:21-24 relate that this expeditionary fleet of Solomon’s would be gone on voyages lasting three years, returning with plants, animals, etc. from other continents. During these years, King Solomon ruled in a Golden Age which was characterized by Israel’s reverence to the Ten commandments. The Israelites used Paleo-Hebrew characters during this period of time. King Solomon’s reign was the high-point of what historians call the Golden Age of the Phoenician Empire (which was really the Golden Age of the Kingdom of Israel, allied to the much smaller city-states known later as “Phoenicians”). This time context makes complete sense for the Hidden Mountain inscription to be made. In ancient times, the Hidden Mountain site would have been accessible by ships sailing from Israel. After sailing across the Atlantic Ocean, the Israelite-Phoenician fleet could sail through the Gulf of Mexico, up the Rio Grande River and to Hidden Mountain site via a large river (now dried up) that flows right past Hidden Mountain.This dried-up river used to be a large one in ancient times when the American Southwest had a wet climate. The dry river-course is surprisingly large and could handle vessels of considerable size. I was quite surprised at the size of this dry river-bed when I saw it personally. The Hidden Mountain site could have been used as a base of operations for the ancient Israelites’ efforts to find raw materials for King Solomon’s massive building projects. Solomon’s scientific curiosity would have also caused his fleets to explore and map as much of the world as possible. The Hidden Mountain site could also have served as a North American site to which Israelites could converge and celebrate the biblical Feasts that God commanded (the Passover, the Feast of Tabernacles, etc.). The overriding piece of evidence about the founders of the Hidden Mountian site is the inscribed text. It confirms that its makers were obedient to God’s laws at a time when a wealthy king of Israel had the motive, the wealth, the peace-time environment and the fleets to reach and colonize ancient North America during the Paleo-Hebrew period. To gain an insight into the sizeable presence of the ancient Israelites (and other cultures) in North America, please refer to extensive documentation on this subject provided in this author’s books, The Origins and Empire of Ancient Israel and Israel’s Lost Empires (see book links). The Bible records that the Golden Age of Solomon was historically brief It lasted mere decades. King Solomon himself engaged in idolatrous activities in the latter part of his reign when he was deteriorating (I Kings 11). The Hidden Mountain site would hardly have been forgotten. The Phoenicians surely would have continued to exploit the mineral wealth of the New World for centuries afterward. My above-cited books record evidence that Greek historians recorded that the Carthaginians (who continued the Phoenician-Israelite tradition in North Africa after the kingdom of Israel fell) exploited the wealth and resources of the New World. If the Romans had not burnt the expansive library of Carthage when they conquered the city, mankind would have had access to all the Carthaginian sailing charts to the New World, maps of its rivers, coasts, cities, etc. Several photographs at the photo gallery support this viewpoint. One photo shows a petroglyph which appears to be an image of the Carthaginian goddess, Tanith (see a very similar Tanith representation on p. 67 in Barry Fell’s book, Saga America). Another petroglyph at the Hidden Mountain location depicts camels. Camels would have been known to both the Israelites of Solomon’s time (camels are mentioned often in the Bible) and the later Carthaginians of North Africa. The presence of an image of Tanith indicates the site was used by devotees of this Baal worship religion in later centuries (Tanith was the Carthaginian name for the goddess, Ishtar or Astaroth, associated with Baal worship in the Bible). In more recent times, the Hidden Mountain site may have been seen as a kind of holy site or meeting place for Native American tribes as Indian clan signs are present in the Hidden Mountain location. Unfortunately, modern graffiti can also now be found there as well. Thos who wish to know more about the Hidden Mountain site can contact Mr. Douglas Jones of the New Mexico Epigraphic Society at the above address. Those wishing to support the New Mexico Epigraphic Society’s effort to locate and preserve ancient artifacts and inscriptions can also make donations to the Society.